So i have NEVER done any kind of pixel art in my life. It has however always seemed like such a cool way style of GFX and I guess my experience with older games has something to do with it as well. I want to do a Darth Malgus kind of posed as the first Sith Warrior picture. I have done my smaller resolution first draft to get an idea of the scale and the color scheme i want to use. I do not plan to do him in all black like the references, as that is SO boring and difficult to distinguish the detail. So keep in mind I am a total noob, and all your suggestions are welcome. P.S. Can we do some vehicles/ships for the comps too, or is it strictly characters? You are more than welcome to do any pixel art that you want to put up alongside your characters :) I would recommend you scale up a version and post it as part of your thread that is easier to see so people can give you suggestions. I wouldn't say that Darth Malgus is all black. 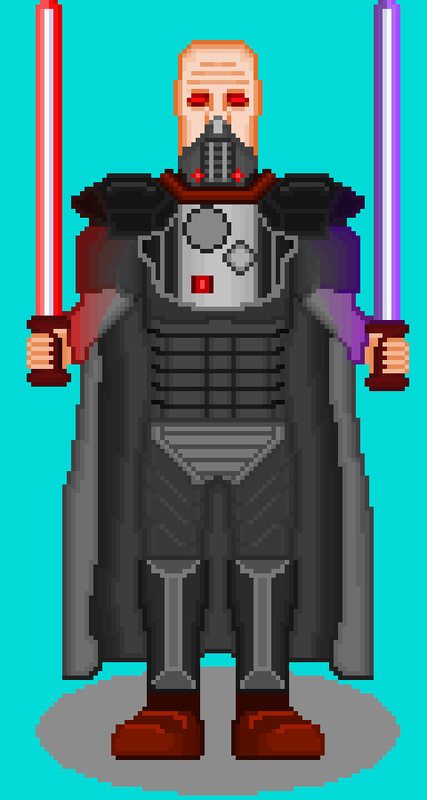 I think his head is definitely blue and his body, while mainly black picks up lots of red highlights from his saber; so you could work with those primary colours. The character is bald which I think is another defining feature so maybe leave the cloak hood off your character. I think the competition is strictly characters so we can have a common discussion. Added x3 zoomed image to OP, and changed the image to a .png saved version. Here is the revised small version. Looks more like a sith to me now. Will be raising the pixel level now, and start detailing. Edit: Changed arm positions and sabre lengths. Thats looking rad! Add in some texturing and some shading and it's looking good to go! The uniformity in line use makes the 2nd one less interesting, and the head in the second one seems rather generic... Round head. I feel the first one's head felt... Dunno, less generic. More pixel-art. It's good you're trying different approaches! @Tuism thanks for the suggestions. I have to agree on the head, even though it is more accurate, it doesnt seem "EVIL" enough for me. I will try and slender it a bit, and see if its more menacing. Also on the light sabres you are correct, they need a "end" pixel. What do you guys think about the thighs, are they not too thick? @Actrox, on the thighs. As far as I know men have thighs that are more uniformly shaped with the upper body and women have wider thighs. That's the anotomy lesson my wife gave me anyway. So yes, the thighs look a bit wonky to me, the are too wide. Also the legs don't look bendy enough to me at the knee. The first black suit had a better proportions when looking at the torso, mid rif and legs. And the legs looked like they could bend at the knee. The didn't look bent, just that they could if the character so desired. Think what is misleading is that the bottom greyt part is actually shin guards, and detailing is still required, so the shin guards go higher than the knees (See reference images), thats why the proportions look out of whack. Got to agree on the thighs, just didn't look right. Hmm, maybe the legs should be a pixel closer together to start with? Bring the thighs more "under" the body? That's what strikes me, but I wouldn't be able to tell without a comparative image. Considered both suggestions. Made the legs smaller on the outside but bigger on the inside. Looks much better imho. 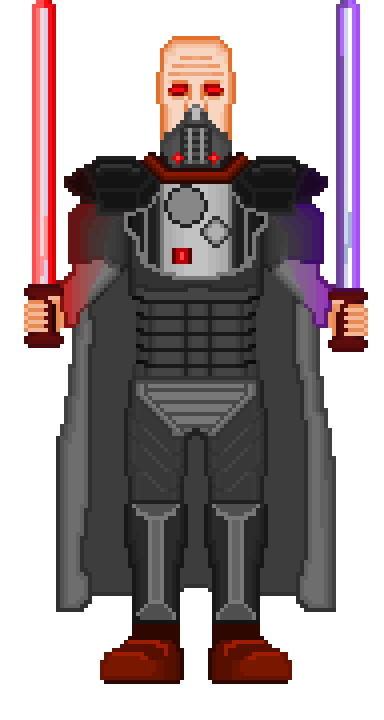 Also did the hands, moved the lightsabre hilt positions and did a little glow effect on the chest and shoulder armor. So. Final day and my final update. I think I am happy to call hime finished. Did a lot of shading, did the cloak, the shin guards and the feet. P.S. why does it resize my images? How can I force it to show full size? Then a REALLY nitpicky bit is that your feet don't match the circular "shadow" type thing you've set up - they look flat on the ground, so should then the background. If you want the sprite to be on a lifted plane (so you could see the "top face" of the ground), you would just make the bottom of the feet less flat against the bottom pixels. Really dig your colour use around the lightsabres! Didn't notice this earlier, but the glow on the arms? Awesome. My entry resized for comp.